On a yellow morning, when the sun is new and shadows long, a puppy comes to live at Beth’s house… And so begins the healing process for Beth who has recently lost her mother. The loss is not overtly discussed in the narrative, rather it is suggested in the evocative illustrations by Hannah Sommerville. When Patches the puppy enters Beth’s life he is a bumbling, tumbling ball of love, but Beth does not engage with him. When he falls victim to a snake attack, however, Hannah realises finally how much she has come to love him. This is a story about grieving, new friends, and the healing power of love. The text and illustrations are subtly layered, and gain in complexity through multiple readings, opening a doorway into deeper discussions. 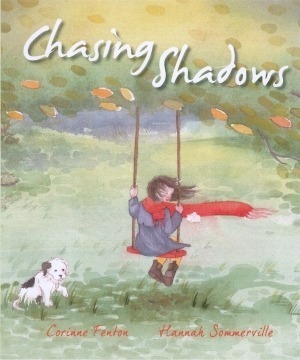 Corinne Fenton approaches the topic with care but remains honest without being precious, while Hannah Sommerville’s illustrations fill out the details in basic but subtle ways…This wonderful book would be of great benefit to children coming to terms with the loss of a family member or any other times of great sadness.